Jay Friedman’s Guide to Chengdu Noodle Dishes in Lucky Peach got me thinking about our local Sichuan noodle scene. What’s available and what’s good? By my count, we have access to over twenty Sichuan noodle dishes ranging from Dan Dan Mian at 54 Sichuan restaurants to Yibin kindling noodles at only two restaurants. You can explore the linked google spreadsheet to see which noodle dishes each Sichuan restaurant cooks, what the restaurant calls the dish in English, and the Chinese characters listed on the menu. 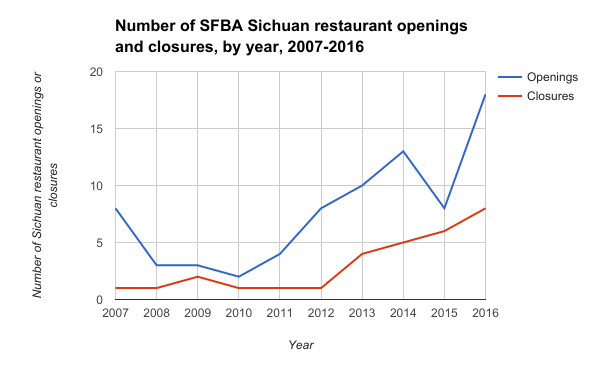 For a complete listing of the SFBA’s 61 Sichuan restaurants, and discussion links, see the Regional Chinese List. To the best of my knowledge, I’ve restricted the spreadsheet only to noodle dishes associated with Sichuan province. Wheat flour noodles are the most common type of carby goodness, and I’ve also catalogued “noodles” made from the starches of mung beans or yams. Many Sichuan restaurants serve noodle dishes from elsewhere in China, and you can find discussions of those dishes or noodle types elsewhere on Hungry Onion (e.g., threads on hand-pulled and knife cut and knife shaved noodles). Please comment in the discussion below about where you’ve eaten these dishes and which places serve the highest quality items. Also see Fuchsia Dunlop’s Land of Plenty for recipes for dan dan noodles, Yibin kindling noodles, Spicy cold noodles with chicken slivers, ants climbing a tree, and a discussion of starch-based “noodles.” She lists 23 iconic flavors of Sichuan in the appendix, and I’ve spotted 9 in the names or descriptions of locally available noodle dishes. With that in mind, noodles dishes are delicious way to hone our collective familiarity with aspects of Sichuan cuisine. There’s no one recipe for these dishes, so there are plenty of opportunities to try different variations and find our local favorites. The variety of local takes on Dan Dan Mian were discussed during a 2013 Chowhound Dish of the Month and on a later thread. Differences those threads noted included soupy vs. saucy versions (Jay Friedman says that the soupy versions originate from outside Sichuan), sesame paste vs. peanut butter vs. no nuttiness, preserved vegetables or not, Sichuan peppercorn or not, ground pork vs. shredded pork vs. vegetarian, hot vs. cold, spicy vs. not, the inclusion of chili oil vs. toubanjiang (chili soybean sauce), etc. I find it interesting that some restaurants switch styles over the years, pleasing some customers but alienating others— Palo Alto’s Da Sichuan is the only restaurant that offers to the customer two options (tan tan noodles 凊蕩擔擔麵 and spicy tan tan noodles; 川味擔擔麵). Both contain a type of pickled mustard called ya cai, ground pork, and a sesame sauce. Ya cai is tough to come by in 2017 (see SF Sichuan ingredient thread), so non-Sichuan restaurants are unlikely to be using them. See also Fuchsia Dunlop’s two DDM recipes in Land of Plenty, Carolyn Phillips’ (author of All Under Heaven) first and second DDM recipes, and a recipe on the Woks of Life blog with lots of photos. If any of the categories listed in the spreadsheet should be merged, or split, please let me know. I’ve listed Sichuan Cold Noodles 四川涼面 and Spicy cold noodles with chicken slivers 鷄絲涼麵 separately, but the meat topping aside, they’re typically the same dish (protein topping, strange flavor sauce, bean sprouts). 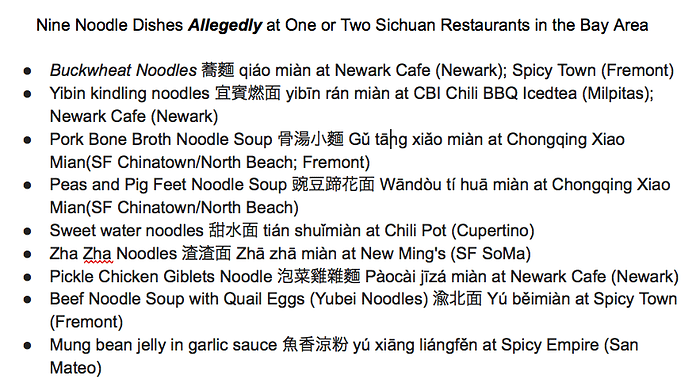 For some reason only one of nineteen San Francisco Sichuan restaurants lists the inclusion of chicken on their menus. Santa Clara county restaurants are more inclined to list chicken than not. See also Carolyn Phillips’ recipe and the Woks of Life’s recipe. 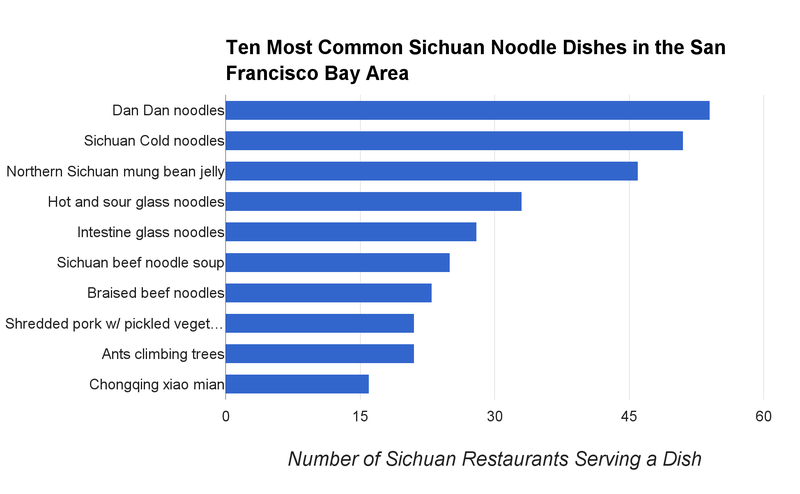 Independent Sichuan restaurants south of the San Mateo bridge have a disproportionate number of chefs from Chongqing compared to up north, where chefs seem to come from Chengdu or Northern China. With them, and a chain of restaurants started by Chef Yiwen “Truman” Du and Jenny Wu, who left Z&Y Restaurant in 2010, come noodle dishes that are new to SFBA restaurants. The most common Chongqing noodle dish is Chongqing Xiao Mian (“small noodles”), which is served at sixteen Sichuan restaurants. Spicy Town in Fremont and Spicy Empire in San Mateo are the only two of the bunch that had been open prior to 2012. I’m not sure when the dish came on the scene. Spicy Empire is the sister restaurant of defunct Pot Sticker in Chinatown, which was started by Chef Truman Du and Jenny Wu, and did not serve the dish. 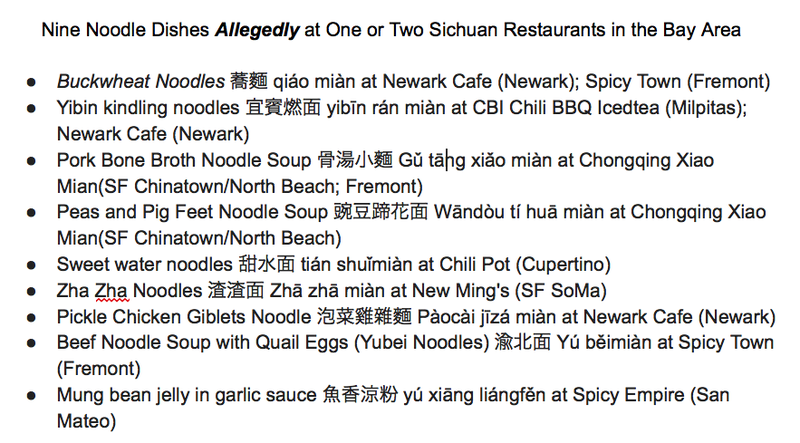 They also own Chongqing Xiao Mien, Spicy Queen, and Spicy King in SF; Newark Cafe in Newark; and Chongqing Xiao Mien in Fremont. Six restaurants in Santa Clara county (South Bay) and zero in Contra Costa County (East Bay) have Chongqing Xiao Mian. Many of us are familiar with China Village’s West-Style 1000 Chili Pepper Fish Fillet in Chicken Broth 川西潑辣魚片, a soup topped with scorched chilies and Sichuan peppercorns, which are carefully removed by the server who then impressively ladles the glass noodles from the dish to each person’s soup bowl. Noodles aren’t the focus of this dish, but I’m including it because its awesome. This dish is at eight restaurants is as largely an East Bay phenomenon spread by former chefs from China Village. JX Cuisine, a Sichuan and Shandong restaurant in Santa Clara, and Da Sichuan in Palo Alto also serve the dish. Is this dish available in Los Angeles? It’s on the menu at a few places elsewhere in the US. There are two common Sichuan beef noodle dishes listed on local menus: (Red) Braised beef noodles soup 紅燒牛肉麵 and Sichuan beef noodle soup 四川牛腩面 . Fuchsia Dunlop, in Every Grain of Rice, describes a red braised beef noodle soup that calls for chili oil and Sichuan chili bean paste (doubanjiang). But that’s not what’s always locally served for dishes named Braised Beef Noodles. Braised beef noodles soup sometimes deliver a non-spicy version of the dish that emphasizes the combination of warming spices (cinnamon, star anise), soy sauce, and sugar (e.g., a recipe at Appetite for China). It’s best to ask the server which version you’re getting. Jay Friedman mentions a dish called za jiang mian 杂酱面 and says this noodle dish differs from Northern Chinese zha jiang mian 炸酱面 in that the pork is kept juicy and it is sometimes accompanied by pickled long beans. The South Bay is the only place to find dishes labeled as za jiang mian. It’s possible this dish exists under different names elsewhere— restaurants claim to make a Sichuan version of zha jiang mian including Tofu Village (SF Inner Sunset) and Chengdu Style (Berkeley), which have chefs from Chengdu, and Spicy Town (Fremont), Spicy Way (Milpitas), and Chef Z’s (San Jose), which have chefs from Chongqing. The version at LA’s Chengdu Taste was reviewed by Jonathan Gold, who says the Chongqing version has peas and the Chengdu version doesn’t. Their recipe for the Chengdu version on Lucky Peach. Indeed, a noodle dish with peas is served at several of the Truman Du and Jenny Wu’s businesses (Spicy King, Chongqing Xiao Mien, etc.). A few Sichuan restaurants like Yi Yuan and Kung Fu Noodles have hand-pulled noodles, or like China Village and Ancient Szechuan make hand-cut noodles, but they don’t use those respective noodles for all of their Sichuan noodle dishes (See threads on hand-pulled and knife cut and knife shaved noodles). Is that strictly a matter of traditional pairings or what people consider taste best (e.g., pasta all’amatriciana with soft fresh noodles instead of dried al dente pasta sounds awful) or economics? I’ve separately listed two types of liangfen, mung bean jelly, but I think they refer to the same dish. Are Northern Sichuan mung bean jelly 川北涼粉 and Heartbreaking mung bean jelly 傷心涼粉 the same? I planned to combine them, but Berkeley’s Chengdu Style lists both dishes. I dug up some lore about where the latter gets its name-- there’s even a trademark dispute. Carolyn Phillips has a recipe for a Guizhou version of mung bean jelly, and gives some comments about how to make a Sichuan version. #Madame Song’s Fish … Noodle? A few local Shanghainese restaurants serve Madame Song’s Fish Chowder 宋嫂鱼羹, a mild Hangzhou dish dating back 800 years (see Carolyn Phillips description or Fuchsia Dunlop’s Land of Fish and Rice). In light of the 1000+ mile distance from Hangzhou to Chengdu, I dissuaded the table from ordering Noodles with Madame Song’s Fish Broth at a recent lunch at Chef Zhongyi Liu’s Royal Feast. My bad— the spicy noodle version [appears to be]((http://english.cri.cn/6566/2009/11/12/902s528747.htm) a Chengdu variation. Can anyone elaborate on what the local preparations are like? One-third of Sichuan restaurants serve Ants Climbing Trees 螞蟻上樹, which is so-called because of the appearance of ground pork clinging to glass noodles. Most Sichuan restaurants name the dish something like Vermicelli with Minced Pork. Mama Ji’s in SF’s Castro district and JX Cuisine in Santa Clara are the only Sichuan restaurants to translate the dish literally (Shandong restaurant Great China does that too). Note that this is more a pork than a noodle dish— not a single menu includes it in the noodle section. #Lots of noodles out there… what isn’t and what’s good? Restaurants that specialize in Sichuan cuisine continue to gain in popularity, and non-Sichuan Chinese restaurants are incorporating more and more Sichuan dishes as standard practice. 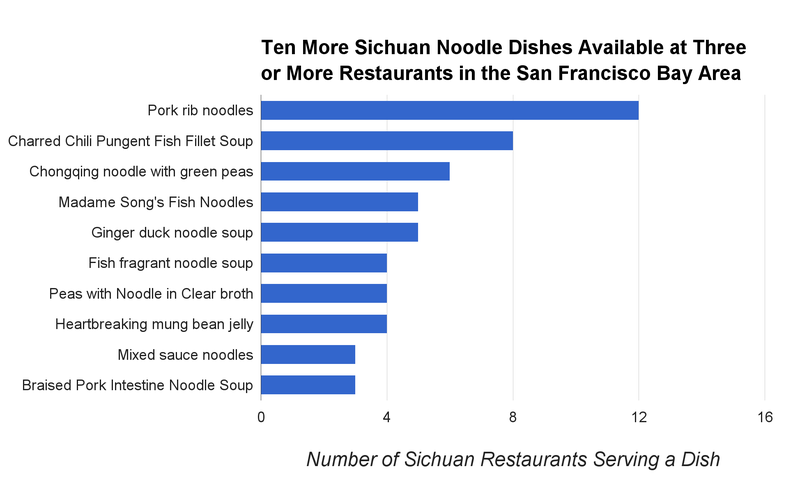 That said, there are plenty of Sichuan noodle dishes absent from SFBA restaurants-- to my knowledge, the style of Guai wei mian 怪味面 Jay Friedman describes in his Chengdu noodle article isn’t available, and either are a few other dishes he mentions: Jiao xiang mian 椒香面, Dou hua mian: 豆花面, and Pugai mian: 铺盖面 or a few at LA’s Mian. Buckwheat noodles are also uncommon and only available at Spicy Town (Fremont) and Newark Cafe (Newark). Variety is one thing. I’d like to hear people’s take on who makes the best noodles in town. We have several pedigreed Sichuan chefs and owners— are noodles part of what they excel at, and do people know of any off-menu Sichuan noodle dishes they make? Royal Feast is helmed by Chef Zhongyi Liu, who trained at Grand Hotel Beijing Hospitality School, and was executive chef at Grand hotel Beijing. His cooking at China Village prior to 2004 was popular with Chowhounds, and Melanie Wong recently discovered he returned to the SFBA. Chef Han Lijun, owner of Z & Y (SF Chinatown) & Chili House (SF Inner Richmond), went to culinary school in Beijing and was executive chef at Beijing International Hotel. Yi Yuan & Yummy Szechuan (Millbrae) Chef Hu Wen Jun, learned his trade at Shijiazhuang Culinary Academy in Hebei. Truman Du, co-owner of six Sichuan restaurants, is listed on the cover of Spicy Queen’s menu as an award winning Chongqing chef. He traveled with leaders of the People’s Republic of China to promote culinary exchange. Chef Tang, of Spicy Queen, is an award winning Chengdu chef. Some of my info may already be outdated, so buyer beware— I created the spreadsheet from paper menus, Yelp menu photos, the rare restaurant webpages, and random websites that have menus. If my info seems wrong and you don’t speak the native language of the server, show them the Chinese characters to see if the chef is still willing to make the dish. recent tan tan mian SF? Is pork bone broth noodle soup (at Chonqqing Xiao Mian) really a distinct genre? My wife and the rest of her family always prefer pork neck bones for soup stock, something they brought from Shanghai, I wonder if there’s anything else about Chongqing Xiao Mian’s dish that makes it distinctively Sichuanese (or Chongqing-ese, to be precise). Thanks for the nudge that Chongqing has long been a separate municipality. I want to be respectful on this point. My understanding is that Chongqing food has innovations of its own, but it’s primarily influenced by Sichuan cuisine. I certainly need to correct the above line that the analysis was restricted to things related to “Sichuan province.” Is it be appropriate to merge things together in general as “Sichuan cuisine” or is it considered more acceptable to refer to “Sichuan/Chongqing cuisine”? Ideally I’d have two separate articles, but there’s so much overlap at restaurants that I’m not sure that would make sense. The short answer is I don’t know whether pork bone broth noodle soup (at Chonqqing Xiao Mian) is unique to Chongqing Nomenclature for Xiao Mian confuses me. According to a interesting read you recently posted about Xiao Mian expert “Brother Lamp”, “Xiaomian describes all varieties of the thin, wheat noodles found in Chongqing, where it is classified as a staple food, not a snack, because of its historically central role in the local diet.” He describes a few varieties, including ones resembling what Chongqing Xiao Mian cooks-- ones topped with ground meat sauce, ones topped with yellow peas that look like chickpeas, etc. Some of those dishes are not labeled by the restaurant as “xiaomian” but perhaps I should take a hint from Brother Lamp that there is a basic model, and all these other dishes are variations whether or not the characters 小麵 are listed on the menu. As for the Pork Bone Broth Noodle Soup, its name does in fact include the words xiao mian (骨湯小麵), so I wonder if they’re supplementing the basic model of Xiaomian with some pork bone broth. Do you recall if their basic model has lots of broth in it (I remember having a ton of noodles leftover, so am inclined to think not). Personally it doesn’t bother me if Chongqing cuisine is considered part of Sichuan Cuisine. There’s too much parsing of Chinese cuisines as it is (et tu, Carolyn?) and there are probably greater differences among the cuisines of various outlying regions of Sichuan and Chengdu, for example, than between Chengdu and Chongqing. I got the lowdown on the noodles at Truman Du’s restaurants. According to the server at Spicy Queen, their Chongqing Hot Numbing Spicy Noodle (Chongqing Xiao Mian) is the Mr. Potato Head of noodles, and the basic model includes a toasted chili oil broth and greens (see reports on the Chongqing Xiao Mien thread). The Tan Tan Noodles is that with meat sauce added, the Noodles with Peas and Meat Sauce has meat sauce and peas added. The Wuhan noodles has sesame paste added, and the Spicy Beef Noodle Soup has braised beef and more broth added. I’ve had the basic model at one of their other locations before, so decided to go nuts and get the meat and peas version at Spicy Queen. The server suggested I stir everything up, which helped warm the cold peas and cold meat sauce that topped the dish. I remember Sichuan peppercorns in the basic model at Chongqing Xiao Mien, and way too many noodles. This one didn’t taste like Sichuan peppercorns and had just the right balance of meat, vegetables, and noodles for a more balanced meal. The meat sauce was savory and salty, and contained minced pork, small pieces of onion, and a scarce pieces of a translucent pickled vegetable (zha cai?). The minced pork was soft and seemed like it had been coated in a starch or tenderized before cooking. The peas were a light yellowish green, and had starchy insides. The pea texture is not my personal preference, but it did provide a texture contrast to the soft thin noodles. They purchase the peas dried from a Korean market. According to the server, the remainder of their noodle dishes don’t use the same formula. @Souperman the server wasn’t sure how the pork bone broth differed from versions that would be elsewhere in China. The Braised chili pepper with eggplant noodles sounded interesting— it’s something the chef created. 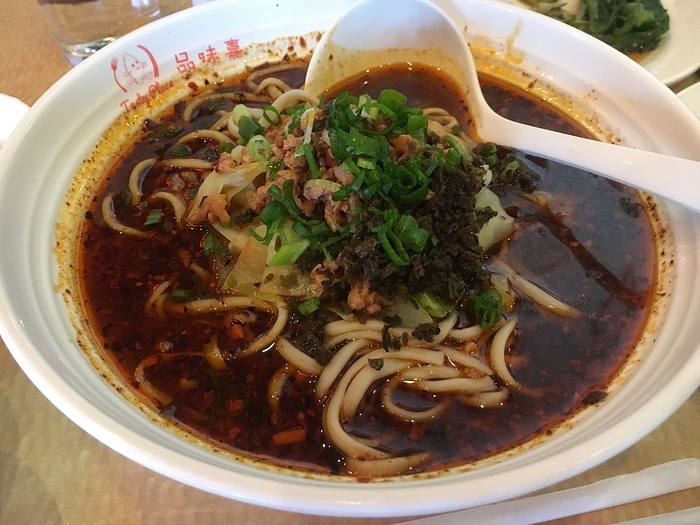 The Szechuan Original Soup Noodle 清湯炸醬麵 at Tofu Village in the Outer Sunset is a soup version of Northern Chinese Zhajiangmian. Noodles, greens, and broth laid on the bottom of the bowl, and the top had sliced scallions and a large portion of meat sauce (soft ground pork, sweet bean paste, and some other savory ingredients). Zhajiangmian is generally a heavy dish, so I appreciated how presenting it as a soup lightened everything and kept the salty and savory elements from overpowering the wheat noodles. The server tried to steer me toward the Dan Dan noodles, and I was glad I resisted the temptation to take her advice. It was the perfect lunch for a chilly day. In terms of categorization, I’m curious to hear how this compares to the Zhajiangmian soups at Spicy Town in Fremont and Chengdu Style in Berkeley. There are no pieces of tofu in the sauce or cucumber garnish as in Northern versions of zhajiangmian, and it’s not at all spicy or numbing. I didn’t taste any Sichuan chili bean paste (doubanjiang), which a Sichuan based blogger says is added to versions of zhajiangmian in Sichuan province. This doesn’t appear to be the soup-less Sichuan zhajiangmian Jonathan Gold described at LA’s Mian or the za jiang mian 杂酱面 Jay Friedman described in Lucky Peach. I had the dan dan mian for lunch at Tofu Village today, and it was pretty good. More balanced and flavourful than the version I had at Chili House. About the right quantity of red oil/broth in the bottom of the bowl, spicy but not overly so. Since I periodically shop at 22nd & Irving Market, I’m going to return to try other dishes on the menu. Thanks for the heads-up! Cool, I’d love to hear more about there are other dishes – – they’re easier to get to than the places in the Richmond district. Did you notice whether Tofu Village’s Dan Dan noodles had any pickley bits in them? Also, how saucy/brothy they compared to chili house? It’s been a while since I’ve had them from the latter, and I remember them being very brothy. Here’s the photo I took. Yes, I remember the Chili House version as being quite brothy, and quite spicy (to the point of being one-dimensional). I think there were pickley bits in the Tofu Village version, and it was more saucy than brothy. Spicy Way in Milpitas has Noodles in Chengdu Style, Chengdu Zhajiangmian, with a tablespoon or so of unseasoned minced pork, peas, peanuts, bok choy, chicken broth and chili oil. I didn’t pick up any numbing Szechuan peppercorns, and the flavor emphasis was more on the chicken broth, which was super savory and more pronounced than at Tofu Village, perhaps because of MSG, either way very good. I like the peas here much more than at Spicy Queen – – they were firm and creamy, but not starchy. The Szechuan hot and sour yam noodles at Chili House in the inner Richmond were intense and tasty. The sourness was from pickle mustard (suan cai) and the spicy numbing liquid was topped with a thick coating of chili oil. Similar to “water boiled” beef, the bowl full of liquid acted as a sauce for the glass noodles, and isn’t intended for drinking like a soup. With each chopstickful of noodles, the force of gravity pulled the yam noodles down and clawed in a surprising amount of the sour chili broth. Note that the hot and sour and yam noodles, with or without intestine, use yam noodles, and their pork intestine noodles use egg noodles. I had this (spicy noodles with peas and meat sauce) for lunch at Spicy Queen today. I think the noodle portion size was the same as at Chongqing Xiao Mian (that is, somewhat large for one person) but the added peas and meat helped make the dish more complex and well-rounded. Also the noodles were properly cooked here, while they were a bit overcooked for me at CQXM. I would have this a couple of times a month if it were a bit closer (one bus for me, but 30 minutes each way). There’s quite an extensive menu beyond the noodles; I’m curious as to how successful other dishes are. Was the dish spicy enough? I had the plain version (or so I believe, it was then identified as “Chongqing Hot Numbing Spicy Noodles” on the Spicy Queen menu) a couple of years ago and it was nowhere near as spicy as I expected, or as the namesake CQXM restaurant on Kearny St. serves. I’ve had both the plain version and the one with “peas” and meat sauce at the Kearny St. resto and I agree that the latter version is much more interesting and satisfying. For the record, I’ve yet to experience overcooked noodles at the Kearny St. venue. Home Style Spicy Pork Noodle Soup; 家常小肉麵 at Millbrae’s Royal Feast has a spicy condensed broth, a rich emulsion that clings to the noodles. Delicious all around, complex not aggressive, with plenty of cilantro and pork belly cubes. Not sure what meat is used for the stock. @augustiner has a request for good Dan Dan Mian in SF proper. Any takers? They’re not Sichuan, but I’ll mention Tasty Place’s DDM here—- for a non-Sichuan place, they’re notable for using lots of ya cai. It’s a stellar soupy version and made with the Millbrae restaurant’s hand cut noodles.